If you're a Scrum Master and looking to make a move out that position, read on to find out what other roles you're time as a Scrum Master has trained you for. I blogged recently on the question of whether a Scrum team can ever get so good that they no longer need a Scrum Master. In this post, I’ll address a closely related topic: Assuming that the role of Scrum Master does not go away, what is the career path for a Scrum Master? In my experience, a Scrum Master’s career will usually evolve in one of four directions. A typical career path for a Scrum Master will start with serving one team. After a while, that team becomes less time-consuming to work with, as issues are resolved and the team takes on more responsibilities itself. At that point, a good Scrum Master will seek additional challenges. Often the logical next step is to begin working with multiple teams concurrently or working with more demanding teams or products. When developing new Scrum Masters, I prefer to put the person in a position to most likely succeed. That will mean working with a team that has neither any difficult personalities nor unrealistic delivery expectations. But, to go from good to great, the Scrum Master will need to learn to work under more complex conditions. This leads to the philosophy that success is often rewarded with additional challenges. A Scrum Master who has been successful in a variety of different contexts and teams might choose to move into a role as a mentor to other Scrum Masters. This will especially be true and feasible as the Scrum Master gains skills and experience. In many organizations, this role would be called an Agile Coach, with the most common job description being that an Agile Coach coaches Scrum Masters (and their teams). Personally, I’m partial to such individuals mentoring rather than just coaching. Much of the benefit these experienced individuals provide comes through them offering guidance (“I suggest you do it this way”). Because of this, I think of these individuals as having become Agile mentors. This is an appropriate path for Scrum Masters who have learned that their true passion is the creative act of developing a product--largely independent of whatever the product may be. Some Scrum Masters enjoy the process of enabling creativity among development teams so much that it almost doesn’t matter what the product is. Think about the radio DJ who just loves being a DJ and doesn’t care if he’s playing classic rock, the current top 40, or classical music. The Scrum Master who loves the process more than the product is a likely candidate to follow a career path to becoming an Agile Coach or mentor. Other Scrum Masters, however, learn that they love what their team is building more than the act of creating it. 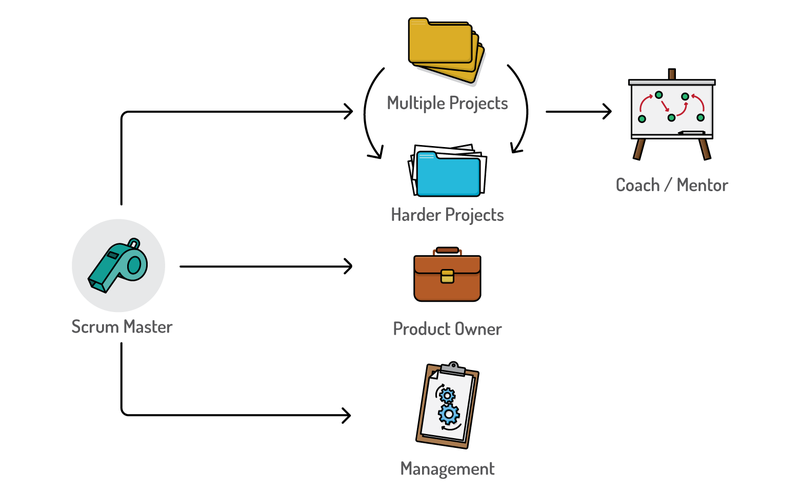 Those Scrum Masters become good candidates to become product owners. I don’t want to imply that a product owner role is above the Scrum Master role in an organization. I consider the roles equivalent in a typical organizational hierarchy. But some Scrum Masters learn that they care deeply about the thing being built rather than the process of building the thing. And from having worked with a team long enough, some of these Scrum Masters learn enough about the product, industry, users and such to become good product owners. Scrum Masters are most assuredly not managers themselves. But through their Scrum Masters duties, Scrum Masters often work closely with those who are. And some will find that work intriguing. Scrum Masters become adept at guiding teams without much authority to say, “Do it because I say so.” Because of this, many can move into management roles where they could demand compliance but, because of what they’ve learned from being Scrum Masters, know it usually is best not to. Especially if a Scrum Master has retained technical proficiency, moving into a role like QA director or development manager can be a fulfilling, logical step. Scrum Masters often become coaches, mentors, product owners, managers or continue as Scrum Masters in more challenging situations. There are many paths a Scrum Master may pursue. The skills learned in becoming a great Scrum Master will serve that person well whether they choose to become a mentor, manager, product owner or just work with more challenging teams. In some ways, asking what is the career path for a Scrum Master is like asking what is the career path of a professional athlete. Some professional athletes use their former careers as springboards to move into broadcasting. Others use the money they’ve made to start businesses--where I live in Colorado, car dealerships and pizza restaurants seem popular with retired athletes. Some athletes use their fame to enter politics. Still, other professional athletes would find the topic of a career path preposterous. They didn’t become athletes as a path to something else. Becoming a professional athlete was the goal itself. And so it will be for many Scrum Masters. The role of Scrum Master can be an end itself. Doing it more and better can remain the goal. A professional athlete cannot perfect his or her sport. A Scrum Master cannot perfect that skill either. There is always room to improve. And so, for many Scrum Masters, there may be no career path other than the continuous improvement in themselves that Scrum Masters demand of their teams. If you’re currently a Scrum Master, what do you think is next for you? If you were formerly a Scrum Master, what have you done since leaving that role? Please share your thoughts in the comments below.